Posted on 01/31/2015, 17:21, by martin, under General. 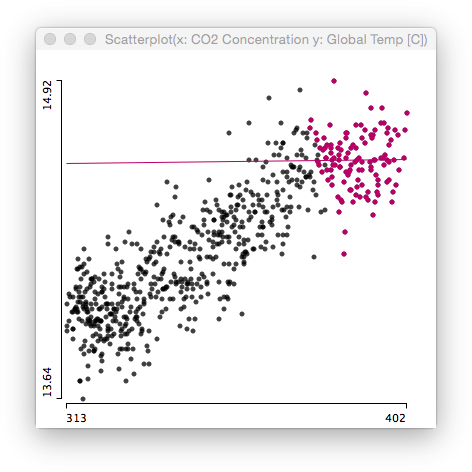 2 years ago, I did post the data on the CO2 and global temperature relationship. The conclusion was: at least in the last 10 years, CO2 concentration kept rising, but the global temperature didn’t. Now, as the last year was the warmest year ever measured, it is time to look at the data again – having two more years of data. Again, there is no (linear) relationship whatsoever. Certainly CO2 is a greenhouse gas, and we all know how a greenhouse works. As we all know, the volatility of a trend estimate is always highest at the end, where we only have data on one side of the estimate. Thus, I am afraid we need to wait for another 2 years of data to tell, whether 2014 was the end of the temperature stagnation or not.